I am #47, a Brisbane tram. What's that you say - there are no trams in Brisbane? Well, that's true if you are talking public transport. But I'm still around. I live out at Ferny Grove and we'll get to that later. When the horse-drawn trams in Brisbane were replaced by electric trams in 1897, the first tramcars used were California combination cars, and that's what I am. 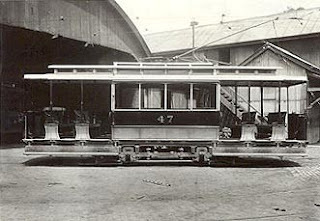 A combination car had both enclosed and open-air seating for passengers, so it was ideal for Brisbane's warm, humid climate. We were originally designed for use as a San Francisco cable car, hence the "California" in my name. Mostly though, we were known as "Matchbox" trams after the popular toy. Here is a photograph of one of my brother trams from that period, taken at the Ascot terminus in Racecourse Rd. One of the neat things about me is that I have dual controls. I can be driven from either end, so there is no need for a turntable at the end of the track (like San Francisco has for its cable cars) to turn me around. The Human who controls me is called a motorman, and he uses his left hand to shut the current off and on, whilst in his right hand is a powerful gear brake. The alarm gong to warn motorists and pedestrians is sounded with the foot, and above the motorman's head there is a switch for cutting the current off completely. At the end of my outward journey, the motorman and the conductor pull down the pole that connects me to the electric wire overhead, swivel it around and then reconnect it in the other direction. Then I can commence the return journey. Here is my picture from 1910. I was one of 63 trams like me that were built between 1897 and 1904 - I was built in 1901. We operated over all of Brisbane's 200km of tram lines and carried millions of passengers, especially during WWII when Brisbane's population swelled with service personnel. Here I am at a depot in 1945. After the war newer and larger trams started to replace us, although some of us were used as advertising cars and some were altered for track cleaning duties. I got to work on the Gardens line that ran up and down Edward St between the Botanical Gardens and Leichhardt St. For that journey I didn't even need a conductor, because people either paid the motorman or simply dropped their fare in a box as they boarded. This route was converted to a trolley bus journey eventually. After we were phased out in 1952 we were kept in storage by Brisbane City Council and only used for special events. Here I am with a brother at the Milton Tram Depot in 1968.The brick building behind me on the left is the Arnott's Biscuit factory. You probably know that Brisbane's tram network was completely closed down in 1969. The Council had decided to keep one of each of its historical trams for posterity, and I was proud to be selected as the representative of the California combination type. Here I am in pristine condition at Milton in 1968. The Council decided to donate some of its historic trams to the Brisbane Tramway Museum Society to be kept for the benefit of the citizens of Brisbane. On 24 February 1969, the Council handed over the first tram (#47 - me!) to the Society. It took some years for the Society to obtain a site suitable for the storage of trams, and then a lot of work was undertaken to provide power, tracks and storage for the trams and spare parts that were gifted by the council. Now the Society operates a proper museum where Brisbane residents and visitors can see and ride on trams, learning about the history of trams in Brisbane at the same time. The Brisbane Tramway Museum is at Ferny Grove and their web page is here. I live there, and even though I am over 110 years old, I still run up and down the tracks with passengers on board. This is a photo of me at the end of the museum's line, and the motorman and conductor are reversing the pole for the return run. Why don't you come out and visit some time. As you know, I am rapt in trams as a method of non-polluting, largely silent public transport in large cities. What I did _not_ know was that Brisbane's old trams were so open and elegant. I suppose you are at least fortunate that some of these historic trams were protected in the Brisbane Tramway Museum Society and are on display for an entire generation (or two) of locals who wouldn't have known what a tram was. #47 is in pristine condition and is still a treat to ride on. These days you have to be locked up in a noisy smelly bus - it's not a fair trade.